Tucson, AZ, WPH Press, 5/6/18– The 2017-2018 Race 4 Eight season ended with the “Player’s Stop” in Salt Lake City, as the R48, WR48, and SR48 stars were treated like royalty at the 2018 Race 4 Eight Player’s Championship by Salt Lake’s unparalleled handball community. 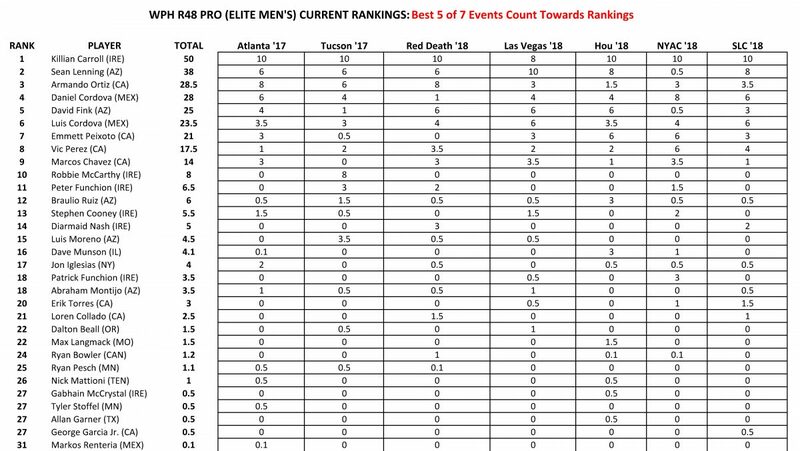 Killian Carroll capped the best season in R48 Men’s Pro history with his sixth win of the season and his third consecutive Player’s Championship. Catriona Casey was her incomparable self in Salt Lake, decimating the women’s field en route to the WR48 year-end #1 ranking and her fifth consecutive WR48 Player’s Championship. Marcos Chavez retained his SR48 Player’s Championship with a scintillating comeback win in Salt Lake’s final.